The target protein is fused with two N-terminal Tags, His-tag and GST-tag, its sequence is listed below. 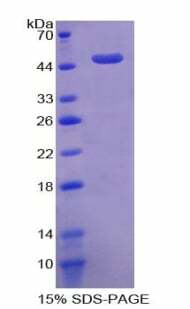 Small volumes of ACVR1 recombinant protein vial(s) may occasionally become entrapped in the seal of the product vial during shipment and storage. If necessary, briefly centrifuge the vial on a tabletop centrifuge to dislodge any liquid in the container`s cap. Certain products may require to ship with dry ice and additional dry ice fee may apply. 1. Presence of the 455C allele of BMP4 and the 8474T allele of ACVR1 gene was significantly associated with decreased left ventricular ejection fraction (LVEF) (p=0.0004 and p=0.046, respectively).